Stock photo of the flags of Red Lake, Ontario, and Canada on flagpoles at Norseman Heritage Centre Park in the town of Red Lake, Ontario, Canada. 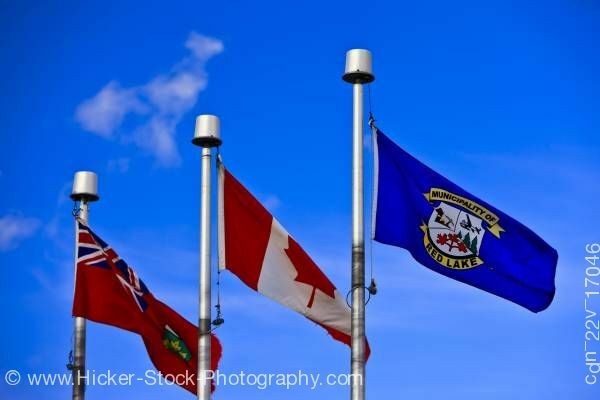 This stock photo includes three flags (Ontario, Canada, Red Lake) on the flag poles in the Norseman Heritage Centre Park against a bright blue sky in the town of Red Lake, Ontario, Canada. Red Lake is known as the "Norseman Capital of the World." The Norseman plane, the first to be designed and built in Canada, was created specifically for flying in the rugged Canadian North.